The Angels will go without third baseman Zack Cozart for at least “a few weeks,” skipper Brad Ausmus tells reporters including J.P. Hoornstra of the Southern California News Group (via Twitter). He has been diagnosed with a grade 1 calf strain. Given the timing, it’s fair to wonder whether Cozart is at risk of missing the start of the season. It emerged over the weekend that he was dealing with a minor calf problem, though it now seems it’s significant enough to earn a place on the scale. A grade 1 diagnosis is at the mild end of the spectrum, though the Halos will need to take a careful approach to avoid a lengthier absence. Cozart, 33, is due $12.67MM this year and next. He earned the same in 2018, which turned out to be a forgettable debut season with the Angels. Cozart limped to a .219/.296/.362 batting line in 253 plate appearances before undergoing a significant shoulder procedure. The focus this spring was on the health of Cozart’s left arm and his ability to regain the form he showed in an outstanding 2017 season. Now, he’ll also need to work through this lower-leg ailment. At his best, Cozart is an elite defender and quality hitter. His ability to get back on track is a key aspect of the Angels’ hopes for the coming campaign. Earning a postseason spot promises to be a tall order in a top-heavy American League. Tommy La Stella, Taylor Ward, and Kaleb Cowart are among the options to fill in at third if Cozart misses time early. Giants officials have taken time this weekend to discuss how to proceed with CEO Larry Baer, Henry Schulman of the San Francisco Chronicle hears. After Baer was involved in a public altercation with his wife on Friday, it’s possible the Giants will have him temporarily give up day-to-day control of the franchise and replace him with an in-house executive, Schulman suggests. That would enable the Giants to go forth with their business as Baer deals with whatever consequences may come his way. As of now, though, the Giants haven’t made a decision, per Schulman. Catcher Jonathan Lucroy fit in well among the Athletics’ players and coaches last year, but the A’s didn’t show much interest in re-signing him during the offseason, according to Susan Slusser of the San Francisco Chronicle. While the two sides held talks in free agency, the A’s never approached the $3.5MM offer he accepted from the Angels, Slusser reports. With Lucroy now a member of a division rival, the A’s are down to the unspectacular Josh Phegley and Chris Herrmann as the only catchers on their 40-man roster. The club did add veteran Nick Hundley on a minor league deal, though, and well-regarded prospect Sean Murphy could debut in 2019. Lucroy’s new team is dealing with some mild injury concerns, Rhett Bollinger of MLB.com writes. The Angels scratched southpaw Andrew Heaney (elbow inflammation) and Zack Cozart (left calf tightness) from Sunday’s game because of their issues. This is the second straight spring with elbow inflammation for Heaney, who started last season on the injured list because of it. However, the 27-year-old doesn’t think the inflammation is as serious this time, and it wasn’t much of a detriment in 2018 – after all, Heaney did go on to throw a team-high 180 innings during the regular season. Similarly, Cozart’s injury seems minor, though it’s not what the team wants to see as he begins the second season of a three-year, $38MM contract. Cozart fell flat over 253 plate appearances last year before undergoing season-ending shoulder surgery in late June. Bill Plunkett of the Orange County Register provides updates on injured Dodgers stars Clayton Kershaw and Corey Seager, tweeting that both players are progressing in their recoveries. Kershaw, who has battled shoulder problems this spring, came out of Sunday’s throwing session unscathed. And Seager will play in a game Monday for the first time since undergoing Tommy John surgery last April. It’s a “significant step forward” for the standout shortstop, Plunkett notes. TODAY: Cozart underwent the surgery, the Angels announced. The procedure carries a recovery timetable of 6-8 months, so Cozart will indeed miss the rest of the season and could miss some Spring Training time if his rehab is on the longer end of the spectrum. WEDNESDAY: The Angels announced tonight that infielder Zack Cozart has been diagnosed with a torn labrum in his left shoulder that will require surgical repair. The Angels didn’t provide a timetable for his return, though it seems unlikely that he’ll be able to recover in time to return in 2018. Cozart, 32, signed a three-year, $38MM contract with the Angels to serve as their everyday third baseman this past offseason. However, after a strong start to the season, he faded badly, hitting just .184/.287/.224 in his final 27 games before landing on the disabled list on June 15. Given today’s medical update, it seems quite likely that his first season with the Halos will come to a close with an overall .219/.296/.362 batting line. It’s the latest in a staggeringly long line of injuries for an Angels club that now has an incredible 13 players on its Major League disabled list. Beyond Cozart, key players including Shohei Ohtani, Garrett Richards, Matt Shoemaker, Nick Tropeano and Keynan Middleton are all on the shelf at present. Rookie David Fletcher and veteran Luis Valbuena have been sharing the workload at third base since Cozart landed on the disabled list, though Valbuena is in the midst of his worst offensive season since 2012. Fletcher was on an otherworldly tear in Triple-A before his call to the Majors and has hit well in a tiny sample of 24 plate appearances. Certainly, the Angels could elect to stick with that pair for the remainder of the season, but the loss of Cozart also presents GM Billy Eppler and his staff with the possibility of acquiring a short-term upgrade at the hot corner at a time when the market figures to be flush with options. Manny Machado, of course, is the biggest name on the trade market who fits that bill, but there will surely be others on the table. Mike Moustakas is already available, and it stands to reason that the Mets would be willing to part with either Todd Frazier or Asdrubal Cabrera. Adrian Beltre stands out as yet another intriguing possibility, as the Rangers are reportedly open to dealing the future Hall of Famer, who is a free agent at season’s end. Old friend David Freese, too, could emerge as a trade candidate next month, depending on the Pirates’ play. At a certain point, however, it’s worth wondering if the Angels will even function as buyers on the summer trade market. The Halos are 4-11 in their past 15 games and have fallen to fourth place in the AL West, currently sitting a likely insurmountable 12 games back of the Astros. The Wild Card prospects are a bit better for the Halos, as they’re “only” eight games out of that race. That said, with injuries mounting and a tough schedule ahead — they have two series against the Mariners and Dodgers each before the All-Star break — it shouldn’t necessarily be considered a lock that the Angels will be in position to be adding pieces a month from now. The Angels have announced a significant roster shuffle occasioned by a few injuries. Starters Garrett Richards and Nick Tropeano are each hitting the DL, as are infielder Zack Cozart and reliever Jim Johnson. It’s not fully clear how severe these injuries are, but it’s still an ugly casualty list for a team that has already had some worrying health issues arise recently. Richards has a left hamstring strain, while Tropeano is dealing with right shoulder inflammation. With Shohei Ohtani already on the shelf, likely joining JC Ramirez and Matt Shoemaker there for a lengthy stretch, the team’s rotation depth has already been tapped into. It seems the team is likely to call upon John Lamb in the near-term, as Jeff Fletcher of the Orange County Register tweets that he’s with the team (though not yet active). That’ll require a 40-man move. Otherwise, the best 40-man possibilities are Parker Bridwell, Felix Pena, and Miguel Almonte. Pena is among the four players coming up to take the open roster spots for the time being. He could presumably become a rotation option, but there’s a pressing enough need that it’s fair to wonder if outside possibilities will be pursued. Along with Pena, the team has called up three additional right-handed hurlers to help absorb innings. Eduardo Paredes, Akeel Morris, and Jake Jewell will all come off of the Triple-A Salt Lake roster to join the club in Oakland. That’ll at least help the team deal with the absence of Johnson, who has a lumbar strain. In some regards — without knowing details yet from the team — Cozart’s injury may be the most worrisome. It’s particularly poor timing given that Andrelton Simmons is also sidelined, though the real concern here is the question of severity. Cozart has been diagnosed with a left shoulder subluxation, a potentially worrying injury. That injury has in recent years sent at least two players — righty Carson Smith and infielder Marco Hernandez — to the operating room for season-ending procedures. Hopefully, that won’t be needed in Cozart’s case, but the fates of those players serve to illustrate the seriousness of injuries of this general variety. The Angels announced tonight that right-hander Garrett Richards exited the game due to tightness in his left hamstring, while Zack Cozart departed early due to a strained left shoulder. As Jeff Fletcher of the Orange County Register writes, Richards’ fastball velocity was down nearly three miles per hour from its usual levels before he exited the game following a two-run second inning for the Mariners. Richards is slated for an MRI tomorrow. Cozart, meanwhile, incurred his injury while making a diving attempt at shortstop and said after the game that his shoulder “separated or popped out a little bit” upon hitting the ground. It’s not the first time he’s had that type of issue happen, he adds, and he’ll be examined further tomorrow. Orioles lefty Richard Bleier suffered an arm injury in Wednesday night’s game, which manager Buck Showalter suggested could be related to his left lat muscle (link via MASNsports.com’s Roch Kubatko). The injury was immediately apparent, as Bleier winced on his follow-through, dropped his glove and immediately began clutching at his shoulder (video link). Bleier already had an x-ray taken Wednesday night, and he’s headed for an MRI on Thursday. While there won’t be an update until that test is complete and the results have been viewed by doctors, but Bleier said that there was “no question” that he was unable to make another pitch, calling the pain “severe” and adding that he’s never experienced that type of injury. While the 31-year-old lefty is hardly a household name, he has a superlative 1.93 ERA on the season and, in fact, has a sub-2.00 ERA for his entire career — a span of 119 innings dating back to his 2016 debut with the Yankees. Drew Pomeranz has been on the shelf for nearly two weeks, but the Red Sox lefty doesn’t sound especially close to returning. WEEI’s Rob Bradford tweets that Pomeranz says the pain in his arm has mostly dissipated, but he has limited mobility in his neck, which is still preventing him from even throwing. Pomeranz, 29, originally hit the DL due to tendinitis in his left biceps, though it would appear that he’s experiencing additional discomfort at this point. Knuckleballer Steven Wright has stepped into Pomeranz’s spot in the rotation and tossed 13 2/3 shutout innings in two starts. The Padres announced tonight that outfielders Wil Myers and Franchy Cordero and left-hander Joey Lucchesi are all set to begin minor league rehab assignments tomorrow. San Diego has been without Myers since April 29 due to a left oblique strain, while Cordero has been out since late May due to a forearm strain. In the absence of both corner outfielders, the Friars have been utilizing a mix of Travis Jankowski, rookie Franmil Reyes, Manuel Margot, Hunter Renfroe and Matt Szczur in the outfield, though the impending return of both Myers and Cordero will shuffle that arrangement. Myers has taken just 40 plate appearances with the big league club this season, hitting .300/.300/.450, while Cordero hit .237/.307/.439 through 154 PAs and began to draw some notoriety for his prodigious home run distances and exit velocities on Statcast. As for Lucchesi, he was among the most impressive rookie pitchers in all of baseball through his first nine starts, pitching to a 3.23 ERA with a 48-to-15 K/BB ratio and a 43.8 percent ground-ball rate in 47 1/3 innings. He’s been out since May 15 due to a hip strain. 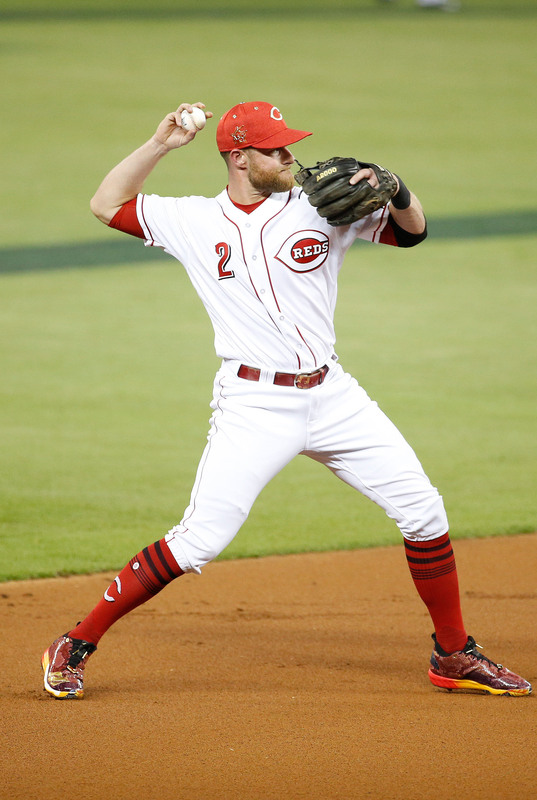 The Angels announced that they’ve signed infielder Zack Cozart to a three-year contract. It’s a three-year, $38MM contract for Cozart, according to Ken Rosenthal of The Athletic (on Twitter), with the salary split evenly between the three seasons, per Jeff Fletcher of the Southern California News Group (via Twitter). Cozart is a client of Excel Sports Management. By signing with the Angels, Cozart puts to bed any questions as to whether he’d approve a change of positions. There’s no chance that the Halos will move Andrelton Simmons, arguably the best defensive infielder on the planet, off of shortstop, so it seems that Cozart will primarily play third base. Adding Cozart to an infield that already includes Simmons at shortstop and newly acquired Ian Kinsler at second base should give Anaheim not only one of the best defensive infields in baseball but one of the best overall defensive clubs in the Majors. Of course, adding Cozart’s bat to the lineup should be a boon for the Halos’ team output as well. The 32-year-old is fresh off a career-year at the plate, during which he posted a superb .297/.385/.548 batting line with career-highs in home runs (24) and triples (7) with 24 doubles added into the mix for good measure. Whether he can sustain that level of power remains to be seen, but it’s worth emphasizing that Cozart’s 12.2 percent walk rate and 24.4 percent chase rate on pitches out of the strike zone were far and away the best marks of his career. Those positive trends suggest that much of his improvement at the dish was legitimate, even if the power could be difficult to replicate. Those of the mind that his power spike was in any way tied to his hitter-friendly home park in Cincinnati, though, should also take note that 12 of Cozart’s 24 homers came on the road, and his .279 road ISO handily topped his .230 mark at home. The Reds made the somewhat surprising decision not to extend a one-year, $17.4MM qualifying offer to Cozart on the heels of that career-best season, so he’ll come to the Angels free of draft-pick compensation. He’ll become the latest addition for an Angels team that has absolutely loaded up since the World Series came to an end; in that time, Anaheim has re-signed Justin Upton to a five-year deal, added Shohei Ohtani to its rotation/lineup and acquired Kinsler from the Tigers — dramatically improving the team’s hopes of at the very least making another run at an American League Wild Card spot. His addition isn’t a perfect one for the Angels, though. Manager Mike Scioscia now projects to have right-handed bats starting at catcher (Martin Maldonado), second base (Kinsler), shortstop (Simmons), third base (Cozart), left field (Upton) and in center field (Mike Trout). Luis Valbuena is on hand to serve as a potential lefty option at first base, though the Halos may have to play Albert Pujols there on days when Ohtani (who does bat left-handed) is in the lineup at DH. Kole Calhoun, at present, is the lone left-handed bat on the roster that appears ticketed for everyday at-bats. That said, the addition of Cozart should largely wrap up GM Billy Eppler’s shopping for position players this offseason. While the Halos could yet make additions to the bench, they’ll likely now shift their focus to adding some help to the back end of a bullpen that remains ripe for some veteran additions. The rotation, too, could conceivably be a place for Eppler & Co. to add some reinforcements, though the team does have a long list of options, albeit most of them coming with some degree of durability concerns. The Braves don’t seem to have interest in bringing Brandon Phillips back to his hometown team, David O’Brien of the Atlanta Journal-Constitution reports (Twitter link). Phillips spent the first five months of the 2017 season with the Braves, hitting .291/.329/.423 over 499 PA before his production fell off after an August 31 deal to the Angels. Atlanta is known to be looking for veteran stop-gap options at third base until prospect Austin Riley is ready, and Phillips already moved to the hot corner last season to accommodate Ozzie Albies’ promotion to the big leagues. There hasn’t been any hot stove buzz about Phillips this winter, as the 36-year-old looks to catch on for his 17th MLB season. The Mets are still looking for help at second base, though they don’t appear to be close on some of the options on the trade market, Mike Puma of the New York Post writes. Team officials “indicated there was little momentum” in talks with the Phillies on Cesar Hernandez and the Pirates about Josh Harrison, while the Twins are giving the impression that Brian Dozier is unlikely to be dealt. The Brewers’ Jonathan Villar is available in the wake of his down year, though Villar isn’t seen “as a serious possibility” by the Mets for now. Looking at outside-the-box possibilities, signing shortstop Zack Cozart and switching him to second base seems like a “long shot” scenario, a source tells Newsday’s Marc Carig (Twitter link). In a full story from Carig, he reports that the Mets are more willing to take on salary than give up significant prospects in trades. This could lead them to Jason Kipnis, who both Carig and Puma cite as potentially the Mets’ top second base target. The Indians owe Kipnis $28MM over the next two season, plus a $16.5MM club option for 2020 that carries a $2.5MM buyout. Also from Carig, he reports that the Mets don’t seem to have much interest in another second baseman, the Athletics’ Jed Lowrie. It probably isn’t safe to rule out the Nationals on any Scott Boras client given the relationship between the team and the super-agent, and indeed, SB Nation’s Chris Cotillo (Twitter link) hears from some in the industry that Washington could be a “dark horse” contender to sign J.D. Martinez. In this scenario, the Nats would obtain a long-term slugger that would help them withstand the potential loss of Bryce Harper to free agency next winter. Cotillo suggests that the Nationals could shop Michael Taylor if they signed Martinez, though I’d argue that Taylor is better served as an (overqualified) fourth outfielder for 2018 who could move back into a starting role in 2019 if Harper leaves. The Phillies announced the hiring of Jose Flores the team’s first base coach and baserunning/infield instructor. This is Flores’ first job on a Major League coaching staff, after spending the last five years as the Cubs’ minor league infield coordinator, and several teams coaching and managing in Puerto Rico, including two years as the manager of Puerto Rico’s national team. The Halos are considering free agent Zack Cozart as an option at the hot corner, per Ken Rosenthal of The Athletic (via Twitter). Though he’s a shortstop by trade, the market doesn’t admit of many obvious holes at that position. But Cozart isn’t just any shortstop: he’s elite at the position, repeatedly rating as one of the best fielders in baseball. With the legendarily slick-fielding Andrelton Simmons already locked in at short and top-quality Kinsler at second, the Angels could arrange one of the best-defending 4-5-6 trios in recent memory, helping to ameliorate any concerns with utilizing the aging Albert Pujols at first. Better still, Cozart — like the others — has also established a solid ceiling at the plate, though perhaps it’s not quite reasonable to expect the 32-year-old to keep up his .297/.385/.548 output from a breakout 2017 offensive season. It also emerged yesterday that the Angels have interest in Todd Frazier, yet another free agent who could fill the team’s major remaining position-player need. Though it seemed at one point yesterday that the organization was nearing a move at third, it seems there are still several irons in the fire at this point. Padres GM A.J. Preller discussed his team’s surprising acquisition of Chase Headley with reporters (including MLB.com’s AJ Cassavell), and the possibility exists that Headley will be flipped before Opening Day. “I talked to Chase this morning and explained to him that we’re going to look at the situation and figure out if there’s space for everybody, was very honest, telling him we’re going to talk to other clubs as well,” Preller said. Headley’s addition has also created a glut within San Diego’s infield, and Preller said that he has already received calls from teams about Yangervis Solarte, Cory Spangenberg, and Carlos Asuaje. The Dodgers are still in “active dialogue” with Yu Darvish, GM Farhan Zaidi told MLB.com’s Ken Gurnick and other reporters. Andrew Friedman said yesterday that the team was more focused on relievers than starters due to the number of depth rotation options already in the organization, though with Darvish’s market yet to fully develop, it only makes sense that L.A. would continue to check in with the ace righty. In regards to the Dodgers’ bullpen search, Zaidi noted that the team is looking for value additions rather than at the top of the market. Rockies GM Jeff Bridich poured cold water on some speculation surrounding his team, telling Patrick Saunders of the Denver Post (all Twitter links) and other reporters that the Rox aren’t involved in trade talks for Marlins outfielder Marcell Ozuna. Bridich also said that the club doesn’t have the payroll capability to shop at the very top of the free agent market for players like J.D. Martinez or Eric Hosmer. One player Colorado is involved with is Wade Davis, as Bridich confirmed that the team is still talking to the free agent closer. The Padres’ rather surprising pursuit of Hosmer has drawn headlines, though Bleacher Report’s Scott Miller tweets that San Diego is more focused on either signing Zack Cozart or acquiring Freddy Galvis from the Phillies during the Winter Meetings. Either infielder would address a more pressing need at shortstop. Preller said (hat tip to Dennis Lin of the San Diego Union-Tribune) that the Padres have a list of eight or nine shortstop options that they feel could be acquired. Lin also hears from some rival officials that the Padres would possibly be open to dealing a young pitcher in exchange for a shortstop.